"Blizzicane". "Snowicane". 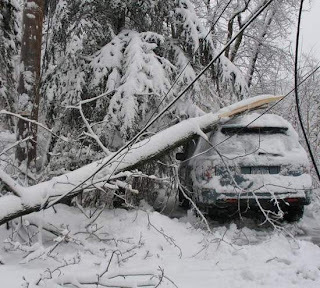 Whatever you want to call it, we got hammered with ice, snow and high winds over the last three days, bringing down trees and power lines across Westchester County. 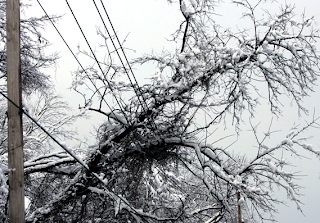 The latest report has about 130,000 people without power during the height of the storm, some of which could be without power for several days. We were one of the lucky ones...until about 3:00 PM yesterday when we lost power. The dangerous road conditions and loss of power forced the postponement of my daughter's sleep-over birthday party, giving me a one day reprieve until I have to deal with six 8/9 year old girls taking over the house. It also forced Friday's 10-mile run to relocate to the treadmill. As much as I hate the treadmill, I survived, but only because I watched portions of "The Distance of Truth" and "Running on the Sun" ("Running on the Sun" used to be available in the ZombieRunner DVD Section but isn't there now, although there are lots of other great running movies to choose from at ZombieRunner). Over 18 inches of snow also meant that the trails at Rockefeller State Park Preserve would be impassable. The thought of 15-18 miles on the treadmill had my head spinning. Eric had a alternative - a run through the virtually shoulder-less roads of Chappaqua, covered with ice, slush and snow, under and over down trees and power lines. I thought about it...safe, dull, tedious run on the treadmill vs dangerous icy trek. Using every ounce of genius that I was given and sound judgment, I, of course, took the more dangerous option - idiot. Man, that makes the snow we have been getting like nothing! It's got to feel a little surreal to be watching a documentary done in excessive heat while it's anything but outside.